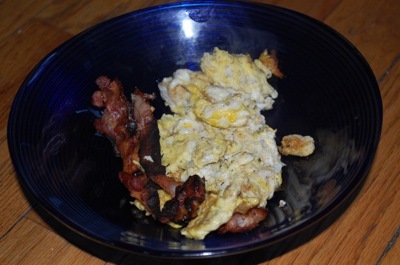 This meal was inspired by both Heather’s manly breakfast and my acupuncturist. It seems that my new motto is “eat more animal fat“, and it is working for me. Some people seem to do fine without – my sister is a vegetarian/vegan and my brother is vegetarian and experimenting with adding in more raw foods. My mom was a vegetarian for most of her 20’s (including when she was pregnant with me!) and my dad follows the accidental vegetarian diet because he lives with so many vegetarians. My dad actually ends up eating more meat than the rest of them (in the form of lunch-meat on sandwiches, the occasional meat chili, and sometimes some bacon on the weekends), and… well – I take after my dad. We look alike, we talk alike, we think alike, and when we hang out together we usually end up working on some project (reorganizing something, or nitpicking about the way something has been put together, or making a mess unintentionally as we try to fix something) and not talking that much – but that’s how we like it. Anyway, onto another meal (dinner). This is an acupuncture-inspired meal. He said to try eating lamb, lightly spiced. Also garlic (good for digestion), ginger (warming and good for digestion), and cinnamon (just good – I don’t remember why). He also recommended coconut oil, so I threw that in there as well. Coconut oil is a great source of saturated fat (NOT always bad for you), great for the skin, doesn’t create harmful byproducts when heated, reduces stress, and aids in weight loss (these are just google results). Speaking of weight loss… Did I mention I lost 2-3 of those pesky intenSati pounds? This happened in one week, and I didn’t eat fewer calories (if anything I ate more). What I did was eat more fat (and meat) and fewer carbs (but not no carbs! I still had lots of oatmeal and rice, and of course many many veggie carbs). Fat can be really good for you. I am actually off to a blogger brunch that has been postponed for far too long… So I’ll update on that later. What are you plans for Valentine’s day? We actually don’t know yet!! wow, good job on the animal fat! i’m glad it’s working wonders for you! i have to go find some coconut oil to make stir fried veggies with now. We’re not too sure about plans either. Maybe just lay low on Sunday and do something together Tuesday? Glad you’re starting to feel better! 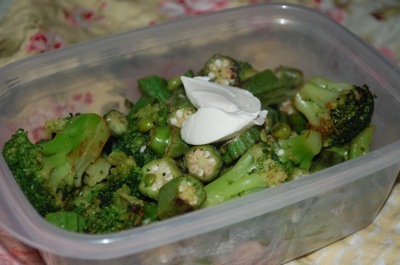 I love that dollup of cream cheese on top of veggies idea!! I’ve gotta try that! Love you, and I hope you have fun at your brunch. CD and I are dining with my parents for Valentine’s Day. So romantic, huh? We love our coconut oil 🙂 Glad to see that you are listening to your body! I am one of those whose bodies can not digest meat very well, but that is ok with me. I love my high raw lifestyle 🙂 Everything looks delicious! oh I am so in love with you and HEAB’s fat love as of late. It tends to get SUCH a bad rep but it’s so important to our bodies! I know it definitely became a bit (okay, a HUGE) “fear” of mine but as I’ve incorporated more of it in to my life i’ve seen nothing but positive changes. Woo lipids! i am one of the ones who is struggling with plan – just suffered through 2 weeks on low carb and had to give it up for now – felt so lousy – but today i am wanting to eat everything in sight – help!! i love coconut oil and the flavor it adds to my dishes. like being in the tropics! It’s such a misconception that fats are bad for you, and technically they have nothing to do with the fat on your body. I think it’s all about the TYPE of fat you’re consuming. If you eat a ton of processed stuff, then yes, your body doesn’t know how to deal with it because it’s not meant as food. People think I’m so thin because of my mostly vegan diet and say it must be because I don’t get any sources of fat. Ummmmmm…trust me, I’m ashamed to admit it but I’ve gone through periods of meticulously tracking my nutrition and I know I easily can get 50% of my calories from fat in a day through nuts, nut butters, olive oil and coconut oil. And that also happens to be a staggering number of calories , but I know what my body needs. However, since all of those are natural fats, my body uses them for what it really needs. We’re very intelligently designed! Acupuncture sounds really interesting, can’t wait to hear more about it! your acupuncturist sounds like he is into ayurveda? i just came across your blog and i can’t wait to keep reading! Love this post Maggie 🙂 I’m with ya on eating animal fats and proteins. I had a giant burger last night, and didn’t even want the bun. My friends couldn’t believe I had eaten all that meat. But yes. I had. I just tried coconut oil recently and am enjoying it a lot! 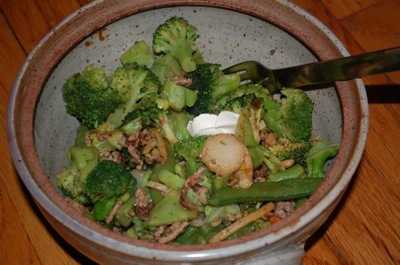 Pingback: Say Yes to Salad » Blog Archive » Oy. What a day. Now: CAKE! FAT FAT FAT FAT FAT FAT FAT!!! I LOVEEEEEEEEEEEEEEE FAT! I AM LIKE A DOG LICKING PAN DRIPPINGS! I AM A DISGUSTING EATER BECAUSE I WANT EVERY DROP OF FAT IN MY MOUTH! HA HA HA. Previous PostPrevious Vegetarians Beware. Yummy Thai Food.